John Konstantaras - For Shaw Media Candice Johnson, coordinator of multicultural affairs at McHenry County College, talks with student Jazmine Rangel in her office Thursday, March 24, 2016. 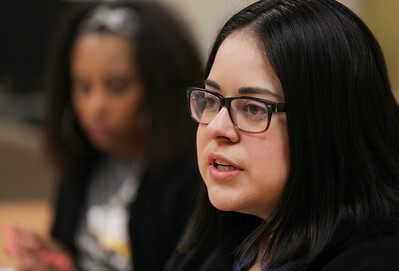 MCC's hispanic population has grown 30 percent in the last few years. 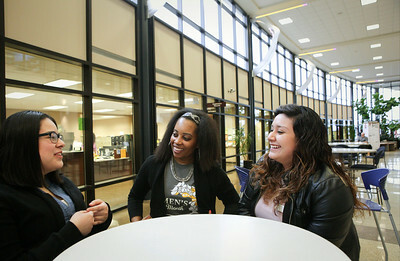 John Konstantaras - For Shaw Media Candice Johnson, center, coordinator of multicultural affairs, talks with hispanic students Leslie Garcia, 19 from Woodstock, and Jazmine Rangel, 20 form Crystal Lake, at McHenry County College, Thursday, March 24, 2016. MCC's hispanic population has grown 30 percent in the last few years. 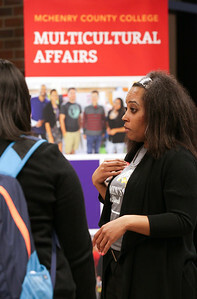 John Konstantaras - For Shaw Media Candice Johnson, coordinator of multicultural affairs, talks with students at McHenry County College, Thursday, March 24, 2016. MCC's hispanic population has grown 30 percent in the last few years. 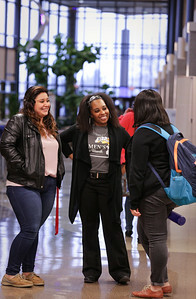 John Konstantaras - For Shaw Media Candice Johnson, (center), coordinator of multicultural affairs, talks with hispanic students Leslie Garcia, 19 from Woodstock, and Jazmine Rangel, 20 form Crystal Lake, at McHenry County College, Thursday, March 24, 2016. MCC's hispanic population has grown 30 percent in the last few years. 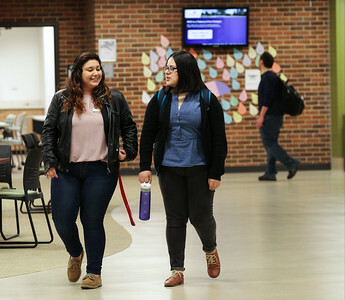 John Konstantaras - For Shaw Media Hispanic students Leslie Garcia, 19 from Woodstock, and Jazmine Rangel, 20 from Crystal Lake, at McHenry County College, Thursday, March 24, 2016. MCC's hispanic population has grown 30 percent in the last few years. 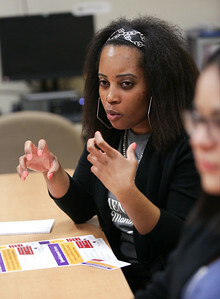 John Konstantaras - For Shaw Media Candice Johnson, coordinator of multicultural affairs at McHenry County College, looks at a video with student Jazmine Rangel in her office Thursday, March 24, 2016. MCC's hispanic population has grown 30 percent in the last few years. John Konstantaras - For Shaw Media Hispanic student Leslie Garcia, 19 from Woodstock, at McHenry County College, Thursday, March 24, 2016. MCC's hispanic population has grown 30 percent in the last few years. John Konstantaras - For Shaw Media Candice Johnson, coordinator of multicultural affairs McHenry County College, Thursday, March 24, 2016. MCC's hispanic population has grown 30 percent in the last few years. John Konstantaras - For Shaw Media Hispanic student Jazmine Rangel, 20 from Crystal Lake, McHenry County College, Thursday, March 24, 2016. MCC's hispanic population has grown 30 percent in the last few years. 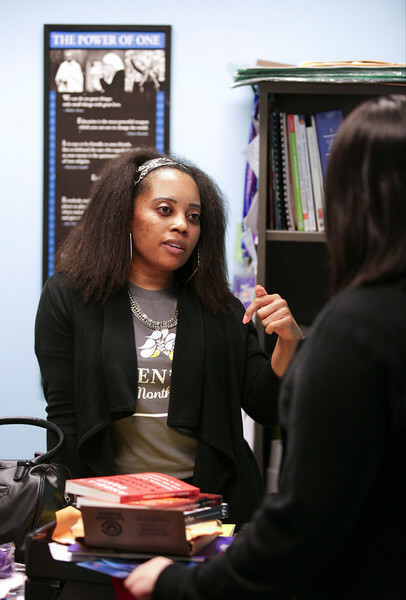 Candice Johnson, coordinator of multicultural affairs at McHenry County College, talks with student Jazmine Rangel in her office Thursday, March 24, 2016. MCC's hispanic population has grown 30 percent in the last few years.